New review to start the week! “Forrest is a true professional. Working with him was easy-breezy and stress-free. Since I was planning a wedding in Houston from New Jersey, all my planning was via email or phone calls. 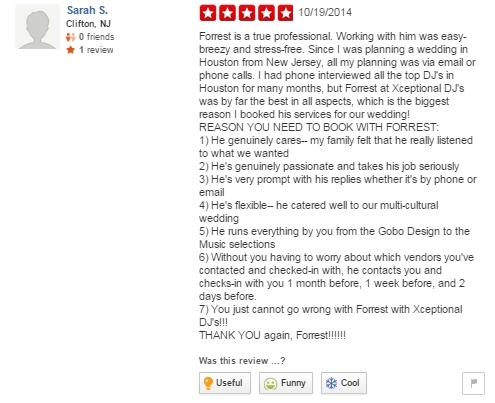 I had phone interviewed all the top DJ’s in Houston for many months, but Forrest at Xceptional DJ’s was by far the best in all aspects, which is the biggest reason I booked his services for our wedding! 6) Without you having to worry about which vendors you’ve contacted and checked-in with, he contacts you and checks-in with you 1 month before, 1 week before, and 2 days before. 7) You just cannot go wrong with Forrest with Xceptional DJ’s!! !